Change never ceases to amaze, and sometimes can come at a dizzying pace. About a year ago, posts titled Super Gras and City Champs were being transmitted off this page, eventually winding up in a book. About a month ago, the last post on this page fabled a ship sinking to the disaster in Seattle, where a bad ending to a season occurred for a good team. That’s football, and more of us will get over it, but the news about Head Coach Sean Payton moving his family to Dallas was a squib kick on all things Saints, and especially New Orleans. The publisher of the coach’s book, now ironically titled Home Team, likely winced at the news, but isn’t feeling any pain. Jeff Duncan of the Times Picayune wrote a few candidly good articles that pulled no punches about the generally negative reactionary sentiments of Who ‘Dat Nation. The appearance of conflicts of interests and speculation was rampant, on the the football, business, and personal fronts. The likes of ESPN and CBS Sports chimed in this week, with hosts accusing people in this city of playing the “Katrina card” in excess. One said New Orleans was a “parochial” city, and should not have taken the news personally. He’s right on the first front, but a few cities in this country like this one have a sense of place about them, and for that it has no apologies to make. It retains the right to feel, as much as anybody has the right to not be here. So there is no “right” or “wrong” public verdict to the news, the bottom line being only what the Paytons decided to do for their family. Katrina Card? 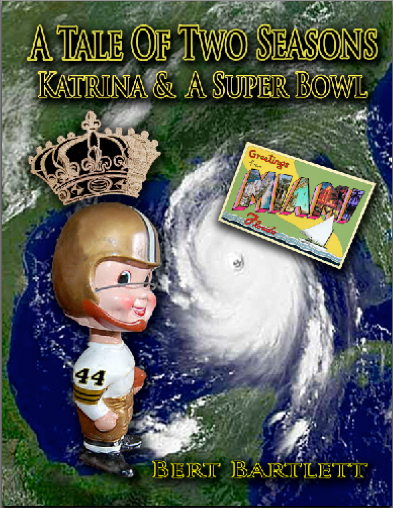 The hurricane suddenly and inextricably changed the city, which will be on worn on New Orleans’ lapel forever, as much as any other accoutrement. The storm is an emblem of something in between the ravaging potential of nature, human foible, tragedy, the absurd, remembrance, some dignity, and more than anything else, adaptation, so those on the outside simply better get used to keep hearing about it from time to time. As much as the city can try harder to “get over it”, others should listen for more than just wails. Sure, Post K mass psyches remain fragile, which is essentially what the Sean Payton news exposed in this community. Pop 100 MPH winds and ten feet of water or so onto any town, and odds are it will remain sensitive about it for awhile. How many NFL cities had people die in their stadiums in an attempt to stay safe? Running to daylight from the sociological fodder, what matters most for Saints fans is what effects it may have on the team. What the news brought to light is that somehow the front office neglected to redo and extend the coach’s contract after leading the Saints to a championship. Unwittingly, Mr. Benson and GM Loomis may have fumbled in that regard, for now, but for all we know the coach and his agent may not have even wanted an extension beyond two more seasons, which now seems like a short period of time. There has been buzz for awhile about the club securing Drew Brees’ with a new contract, as it should, but was the head coach unintentionally slighted, allowing him to think about life in other ways than walking the sidelines in Black and Gold? It appears Sean Payton was somewhat taken for granted, and Saints fans suddenly were faced with what their team could look like without him. The subconscious is a subtle but powerful element to any football player, and team, given the mental and physical exertion the game requires, particularly if the objective is to separate themselves from the pack of parity in the rest of the league. Whether an outfit is ready to play or not is discernible shortly after any opening kickoff. Somehow, deep in the recesses of the minds of Saints players, if it’s not certain their coaching staff will be here much longer, or there is an assumption that the current program has essentially run its course, this could lend itself to a little less focus, drive, or urgency, just enough to slightly lessen their intensity and performance as a group. It’s akin to easing foot pressure on the accelerator, without realizing it. Witness the regular season finale that was a debacle of effort against Tampa Bay, when there was nothing really at stake. The emotional hangover may have contributed to what the mess out west the following week. These guys are pros and will prepare and play hard in the business they are in, but they are also inexorably human, which is why plenty of games get won and lost, particularly the ones that matter. No ambiguous assumptions were buried inside Saints noggins when they went 16-3 and won the Super Bowl. Well said, Bert! I totally agree with every word in your article. Glad you liked Linda. Is Ronnie coming in for Mardi Gras? Every team has its motivation issues. If the ball bounces the Saints way a few times and they get the idea that another SB is within reach, there is no reason why they won’t put their shoulder into the wheel and try to make it happen. Peyton buying his house in Dallas is definitely left footed but I am sure he has his family issues. Personnel moves are far more important. The Saints have more free agents than any team in the league. On top of the collective bargaining agreement quagmire, many Saints, as we know and assume them to be part of the nucleus, may be no longer. It is chess time on the roster. Saint fans should not worry so much about where their coach lives with his family, they should be concerned about how their team fell apart last year! GO GIANTS! We have firm memories of the Giants ! I believe the chapter in A Tale Of Two Seasons is Escape From New York! We would have loved to face the Gmen in the playoffs…. Right on Burt! As always, your take on situations illuminates the apparent even more, and evinces countless emotions that need release. It also stands tall in an allegiance to the more colorful of US cities. “There are three good cities left in the United States: New York, New Orleans, and San Francisco. All the rest are Cleveland.” Tennessee Williams. Regarding Sean Payton moving his family to Dallas, I am reminded of Bert Bell, the commissioner before the gold standard of Pete Roselle. Yet even Bert Bell found something to leave as his stamp on the game, which unfortunately has been all but usurped since the time of Unitas’ classic sudden death win in Dec. of ’58. Bell insisted that players live in the cities in which they played. No ifs ands or buts. “These people pay your salary; you need to support their community.” I know this is wishing for something that will never return, outside of individual players taking this responsibility upon themselves. But the truth is, that egocentric sports participants will hardly ever admit how professional sports is an insulated world from the day to day experience of most people. The only reason any player or coach makes a living is because human beings endow athletic competition with value. Outside of real people giving a sport value, it fundamentally has none. And that is actually the beauty of it. No sport can feed people like farming. No sport can educate people like teaching essential of living. No sport can even provide essentials to a community like indoor plumbing. And that’s fine. Professional sports are superfluous, which is a grand thing. To be able to have the luxury to care so much about something so unnecessary is what they are ultimately all about. The fans endow value to the game. Without fans giving the game value, it fundamentally has none. The few coaches and players who admit this reality are all too rare. Their paychecks come from individual people taking time out of their lives to support a cause for the sheer beauty of supporting it with no ultimate reason but communal enjoyment. Sean Payton moving to Dallas reflects the arrogance and ignorance so rampant in the billion dollar industry so far removed from the real world in which the rest of us must live. Well said Ya Ya. Yes the NFL and all big time sports, including the colleges, should kiss the ground every morning that as many people in this country care about them. There is an argument that too much is devoted to them, and entertainment in general, something of an elephant in the room. Arrogance is if the NFL and the Players Association do not come to terms. Maybe an extended break from it all would not be so bad, for lack of a better word, some cleansing. I think we need to give Coach Payton the benefit of any doubt for his move for family reasons, not that he needs it from us. Will you be at the Oak Alley Author’s Day? If so, why don’t you share the times and dates you will be out there! You bet I will be in ‘Dat Number for Louisiana Author’s Day book signing, at Oak Alley Plantation. In good company, with 3 other authors of notable titles. It is this Saturday the 19th, from noon to 3 PM…..
Next Post Catching Up With The Shock, Pierre, The Oaks & …….Stella !